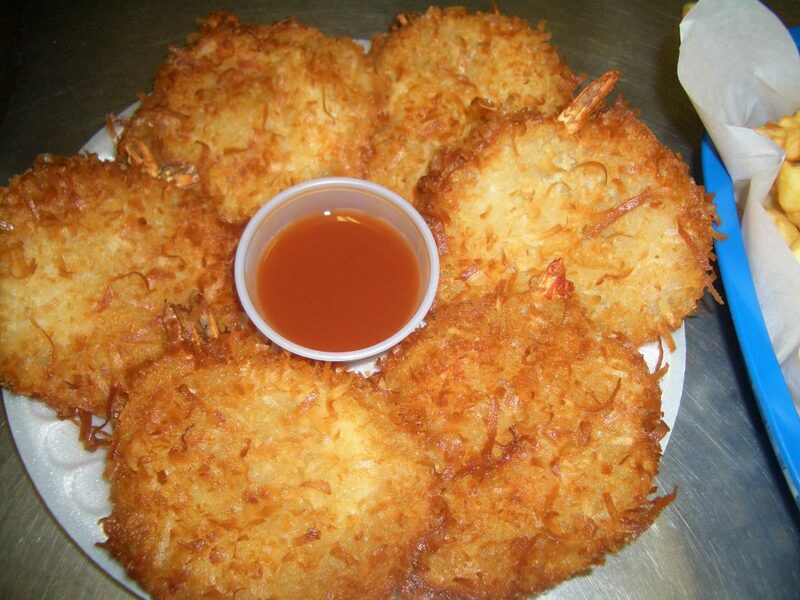 Kahuku-style Fried Coconut Shrimp – Yori, Hey! This is a sweet and crispy shrimp recipe. This was the most popular dish at the Kahuku Grill in Hawaii. Clean and cut the shrimp first. If you have whole, shell-on shrimp, remove the shell and head, leaving the tail. Remove the ‘vein’ and make a butterfly cut. Next, prepare the batter by mixing the flour and water in a small bowl. The batter should be pasty and not too runny. One one plate, add some flour for dipping. On a seperate plate, mix the bread crumbs and coconut flakes together. Coat the shrimp with flour in the first plate. Now, take one shrimp, holding it by the tail, and dip it into the bowl of batter. Move the battered shrimp to the bread crumbs, coating the shrimp thoroughly. Place the coated shrimp onto a plate and continue the batter- and breading process for the rest of the shrimp. In a cooking pot, add enough frying oil to cover the shrimp completely. Turn on the heat and wait for the oil to get to a cooking temperature between 175ºC to 190ºC or 350ºF to 375ºF. If you don’t have a frying thermometer, drop a few bread crumbs into the oil. The crumbs should sizzle steadily without popping or jumping when the temperature is in the right range. With the oil heated, dip the shrimp in and let them cook until golden-brown. Remove the first batch and continue cooking the rest. To make the shrimp sauce, combine all the shrimp sauce ingredients and stir.